I'm in favor of the current (larger number) of regions. They don't seem to be too small, and that would allow us to diversify the province a lot more in terms of weather and environment. Six or seven is much too few in my opinion. The main issues I see are the ones much too small, such as the Wrothgarian Foothills which, while I agree should have separate environmental factors from the mountains and surrounding regions, does not make much sense to only be 3 cells wide. Other smaller, but more compact cells such as Skeffington Wood, Ravennia, and the forests seem fine to me. High Rock is very diverse, and a Witch Coven should not have the same environment as the mountains near it. Hi, author of one of the maps on the first post and just wanted to give my thoughts since this topic seems to be alive for the first time in a while. First, don't use the name Blackhead. I picked it out of names in TES:II on Baelfiera because I wanted a town on the island other than Direnni tower. 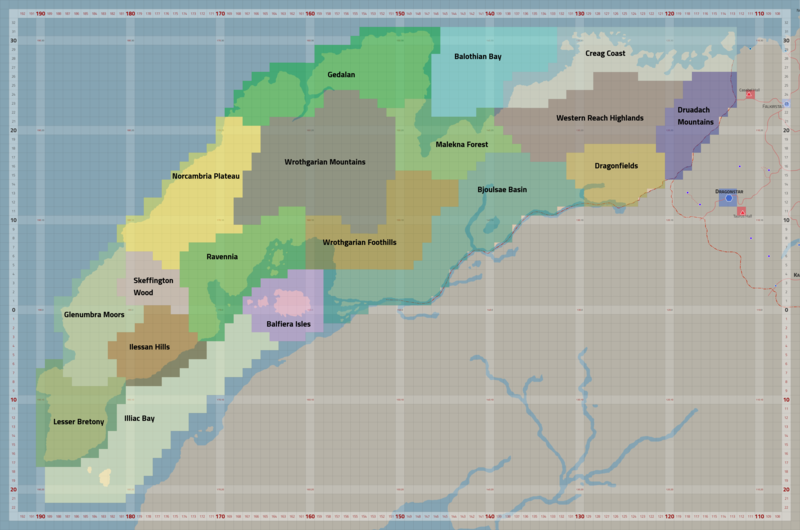 Despite it being technically lore friendly it is just another randomly generated name out of thousands (just like Gallomore, Cathwych, Merbourne, Boreal, Whitefort and Grimhope as far as my map is concerned) and given effort the team could come up with something much better. 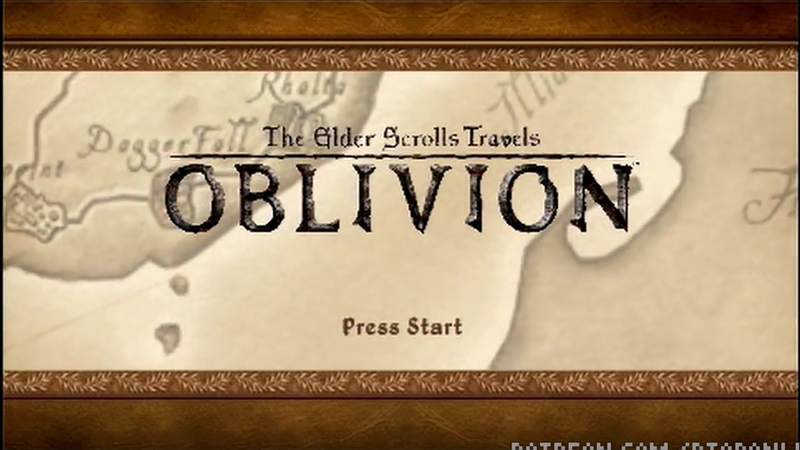 Second, I'd recommend not using names that are shared between regions and settlements for both (Wrothgaria, Ilessan Hills, Glenumbra ect) This is a relic from TES:II's way of doing regions which were political boundaries not climate boundaries and I cant think of another TES game that has a region that shares its name with a settlement. Having the names be separate will lead to some nice diversity and a lack of confusion IE it will feel better in general IMO. Third, Alcaire should be added to the HR map concepts. Out of all the smaller settlement on my map Alcaire probably has the most lore actually supporting its existence. Its the supposed birth place of Hjalti Early-Beard which could lead to some fun Tiber Septim heresy plots . I'm also fairly certain that it was one of the settlements recorded as first settled by the Nords back in the first era which is more than can be said for alot of the towns in High Rock. The Knights of the Flame in Anticlere also have connects with Alcaire so that could lead to some fun concepts too. Fourth, the towns of Glenpoint, Anticlere and Dwynnen should probably be considered small cities instead (HEAVY packed 2 cells at a minimum) These are some of the more famous cities in High Rock's history and probably shouldnt be demoted simply because they are under the rule of Daggerfall/Wayrest and because of the Warp. Each has a Knight Order and most likely a large temple which would take up a decent amount of area alone. Illiac bay is one of the most urban and populous areas in Tamriel 'land of 100 kingdoms' and may do well with a bit of crowding. Look at the river Thirr in TR and the populations there as an example. Lastly, I'm going to have to agree with R-Zero on the regions. High Rock has alot of very drastic climate changes and the only way to do it justice is by implementing precision regions rather than blanket regions. I like R-Zero's map in general and think its a good starting point. Agreed on all points. Although Alcaire has already been added, north of Balfiera. We also renamed Blackhead, I can't remember to what. @Roerich Where is the more up to date concept map? I was just going off of what the last one on this thread that had settlements on it before it turned to a conversation about regions. Small note: do keep in mind that every region you add means another set of regional terrain assets, flora, and textures, requiring more work in a field that not a lot of people have expertise in. What's the reasoning behind Lesser Bretony? Wouldn't Lower Bretony be a better name? Does Balfiera Isles need to be separate region? Why not merge it with Illiac Bay? On Redguard Map region to the south of Skeffington Wood is called Ebon Wastes. Well Ebon has color pretty close to moors, so renaming Glenumbra Moors is a possibility and it would make Wrothgaria the only settlement with name very similar to the geographical region. 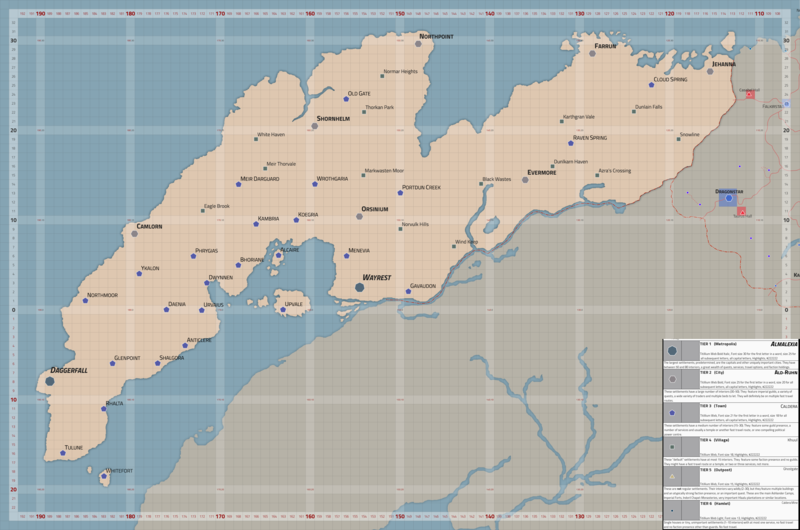 The map from Redguard has some more region names(many are very hard to decipher) like Orbas (Norcambria Plateau? ), Carn Prae (Norcambria Plateau? Gedalan? 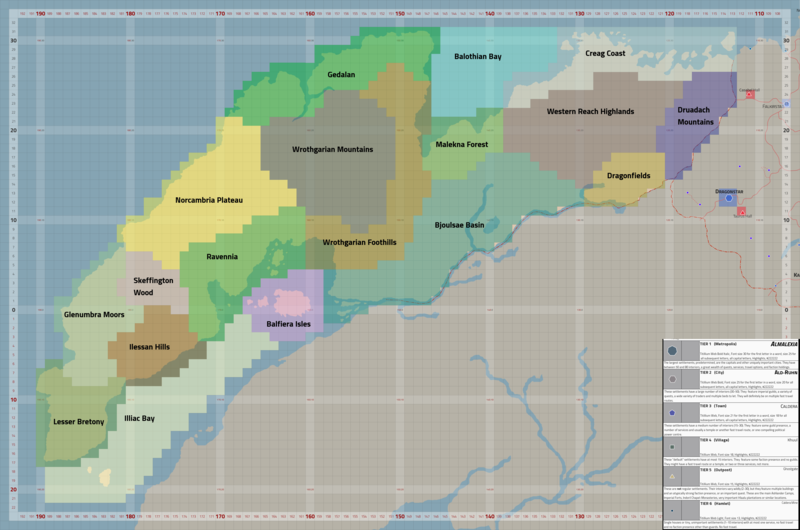 ), Gelders Tot (western Wrothgarrian Foothills? ), Nervlk Hills (Nervulk, Nerolk?) (eastern Wrothgarrian Foothills? ), Wind Keep (southern Bjoulsae Basin? ), Menearn Moor? (northern Bjoulsae Basin? ), Grun? Dyke (Malekna Forest?). However most, if not all, of them are pretty terrible. The burghers of Anticlere, for instance, still noisily commemorate the Battle of Duncreigh Bridge, the "famous victory" of their Duke over the neighboring hamlet of Sensford in 1E 1427 (a battle which apparently achieved nothing, as each village continues to boast its own ruling family of antique lineage), by marching each year down Sensford's main street, a progress that results in numerous injuries on both sides even when it does not provoke a brief war between the "knightly orders" of the two villages. Basic settlement placement and tiering. 1. 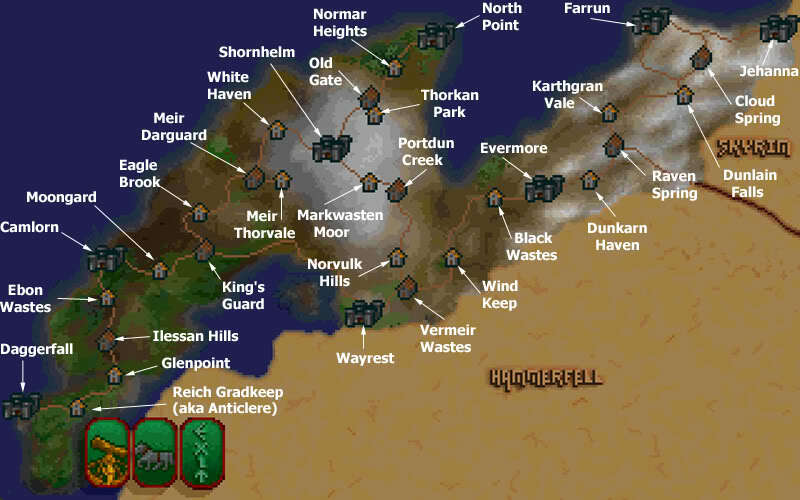 Daggerfall and Wayrest, being most prominent High Rock cities, are Metropolices (Tier 1). 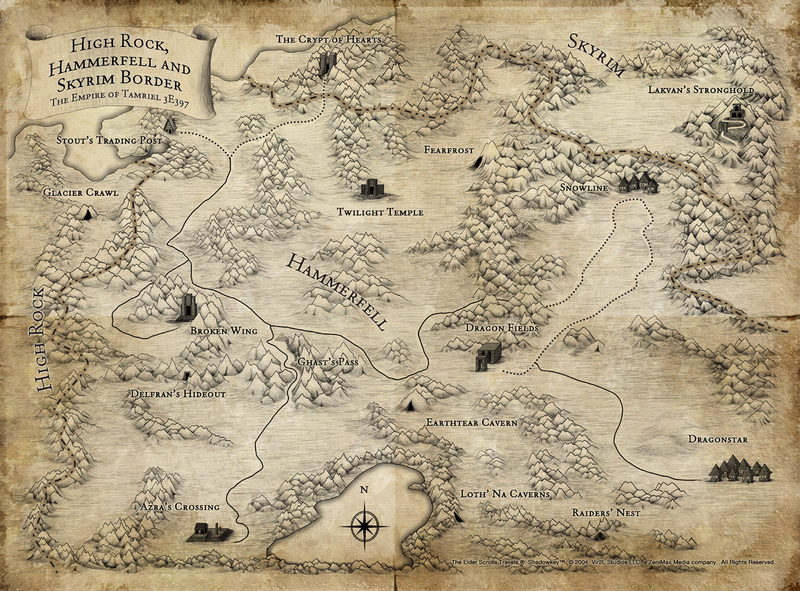 Ilessan Hills and Glenumbra are removed due to being regions instead of settlements in our version of High Rock. Adding post-Warp kingdom allegiance colors using info from PGE3 and The Warp in the West. Note: Jehanna is occupied by Haafinheim since the War of Bend'r Mahk. Ykalon got destroyed in a massive magical fire during the Warp, together with most of Skeffington Woods. Further note: Orsinium controls Mournoth, a teritory across the Bjoulsae from Wayrest. Lowering the tier of several settlements from Daggerfall due to overabundance of Town tier ones in the region. 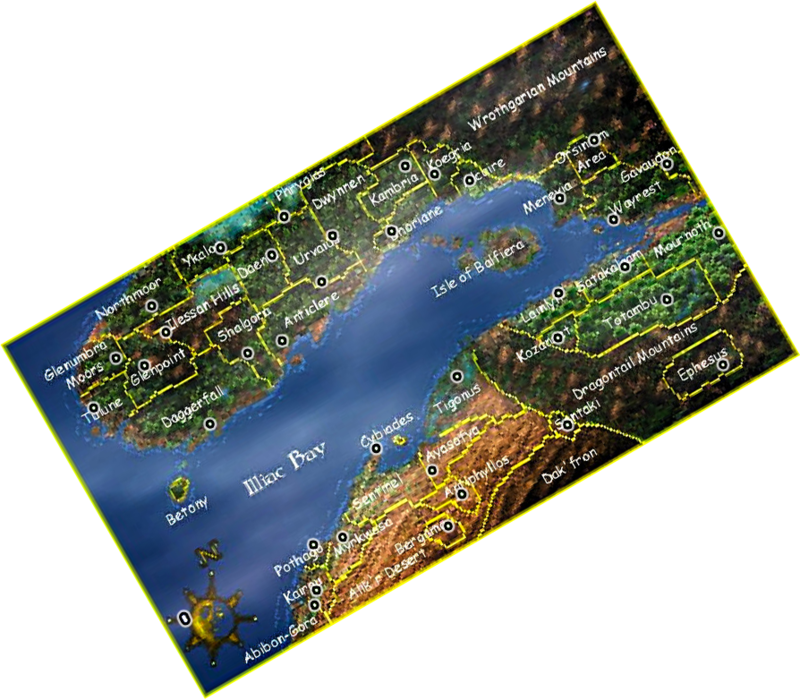 Only the settlements with little lore significance got diminished (except for Whitefort of Betony that was made smaller because of its position on a relatively small island). I've also received a proposition to swap Shalgora and Rhalta placement, which would allow the former to keep its Town tier. What do you guys think? Looks good to me. One of the biggest recurring problems with the mapping endeavors was excessive population density making the map feel crowded. Here though, each kingdom seems to have a reasonable number of settlements and the area east of Wrothgar seems to be fairly wild. I'm still a bit concerned that some of the denser regions might have trouble fitting in dungeons and such, but given the sheer age of many of High Rock's cities, you could probably just as easily fit dungeons under them. So yeah, ultimately I think this is a totally workable map, barring a few inevitable debates on which towns actually deserve focus, though I don't expect much change. Moving Evermore can be considered, we still need to figure out what Evermore's identity is though so whether it needs to be moved to the river should be part of that step. Well, it's my fault because I thought Evermore is in Western Reach Highlands Region which is not. And Evermore in TES: Online is actually in Bangkorai Region which is in both High Rock and Hammerfell. Anyway forget that, those are just outside suggestions. Anyhow I think Evermore placement should take into consideration its proximity to the 2 or even 3 rivers and a lake. From practical point of view such city would be built very close to one of those. Right now the current basic concept of Evermore is a city of hedge-wizards, high fantasy oriented. They are probably going to have fountains in the city so they'll need water anyways, maybe they tapped into an aquifer or something. -	On my map either markwasten moor was higher up, and controlled by Shornhelm. 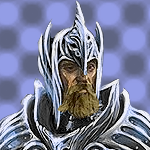 -	Karthgran sounds too Nordic to me, I think we need a substitute name for that town. -	Snowline is featured as such in shadowkey, should we keep the name? 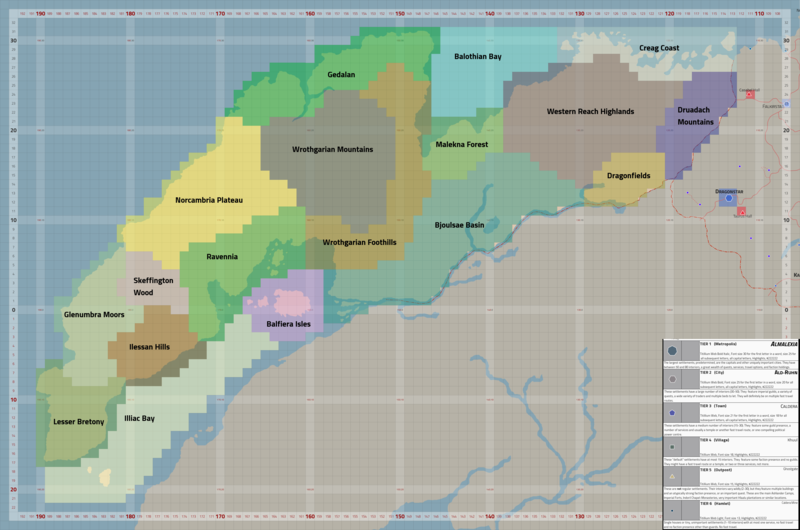 -	In my opinion some towns can be elevated to cities, we’ll have to discuss later which(Dunlain among others). -	Wind Keep sounds more like a town that is dominated by a castle that was built long ago, and a village was built around it. In my opinion it should be controlled by Wayrest, rather than Orsinium. Or maybe a location that’s fortified, where both parties are present. -	Evermore controlled villages should have unique names. 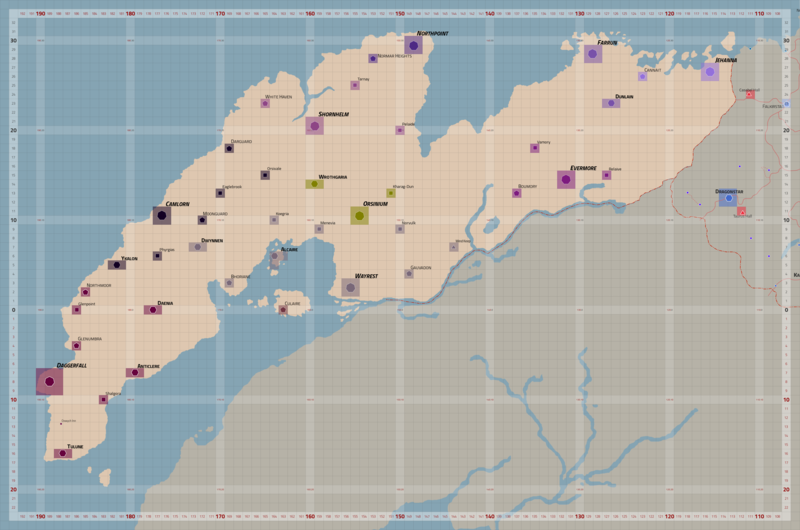 -	In my map I also had Moonguard and Glenumbra as towns.